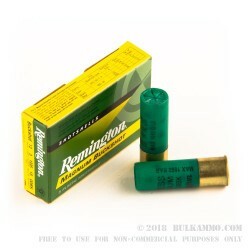 The heft and power of a 3 inch magnum load isn’t fully realized until you shoot a load of hard hitting 15 pellet 00 buckshot out of your favorite Magnum shotgun. Only after shooting that load can you say you truly have an appreciation for the massive power that is possible with a 12 gauge shotgun. 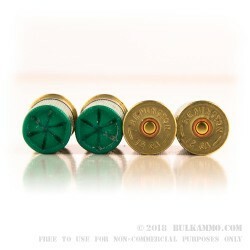 Sure, you can get bigger loads, and even in 3 ½” lengths, but the catalyst is the massive 3 inch buckshot loads. They wake up something in our shotgun and let you know exactly what you’re doing. Aside from delivering excellent, eye opening power for the shooter they deliver devastating truck stopping performance for the target. 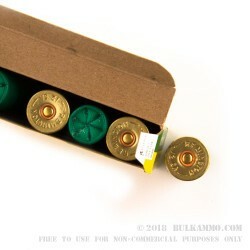 The 00 Buckshot round with 15 pellets out of a 3 inch Magnum is among the most potent mainstream rounds in existence. 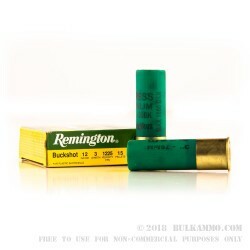 This is 50, five round boxes of the Remington standard load box, made for hunting and usable for personal defense, but generally reserved for field use against the largest game. The well-known green and yellow box with no law enforcement stampings or mention of use cases on the box is a dead giveaway. What you’d be using this for though, is up to you. The large game varieties that can be taken with a load of this dominance is quite a big offering. Probably this is best suited for the largest deer at 60-110 yards.